Balmenach – Glenlivet – Single Malt – 12 y – 0,7l Bottle – Cask Strength 55,4 % Vol.Alc. Custard creams. Soft grassy notes with hints of lime, kiwi and eucalyptus. Mannochmore -Single Malt – 20y – 0,7l Bottle – 52,7 % Vol.Alc. Goosberry, barley water and meringue. Blended Scotch Whisky – 12 y – 0,7l Bottle – 46% Vol.Alc. 65 % malt Whiskies and 35 % grain whiskies from across Scotland. This is the fourth Blend of this 12 Year Old Blend to be bottled. This release has had Whisky from Balmenach – Glenlivet, Glenfarclas and Invergordon Grain Whisky added to the privious vatting. 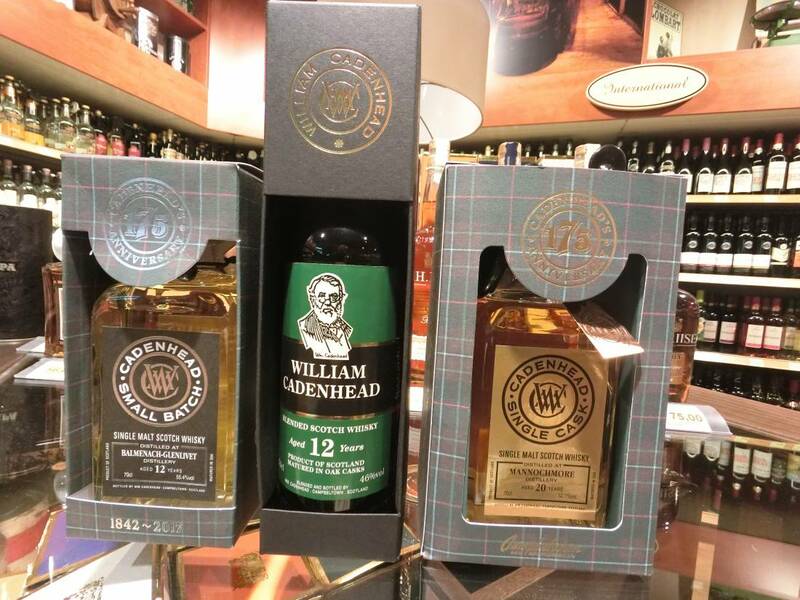 William Cadenhead established in 1842 is Scotland`s Oldest Independent Bottler. They never chill – filter or add colouring to any of there whiskies.